Coronado by Meade SolarMax II 60mm Solar Telescope with RichView system. This double stacked unit excels at observation of solar surface detail with a .5 angstrom bandpass. Features two fully tunable H-alpha etalon filters, one internal and one external. Used around the world by serious solar enthusiasts and professional research facilities alike for observation of surface detail and prominences on the Sun in hydrogen-alpha (Ha) light. Powerful but very portable, this high resolution Solar Telescope offers dedicated visual observation of the Sun as well as high quality imaging. 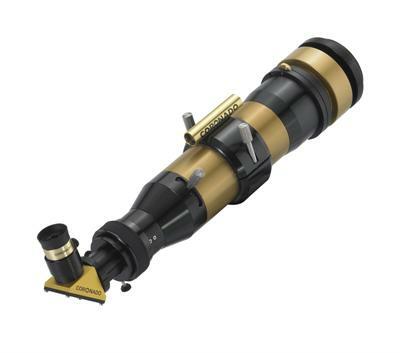 The new Meade Coronado SolarMax II represents a breakthrough in solar observing with the new and revolutionary new RichView tuning assembly. This patented system allows direct tuning of the primary filter etalon. No other commercially available Ha telescope can provide the tuning range and accuracy of the SolarMax II. Now you can tune for the highest contrast views of active regions, flares, filaments, and other surface detail, or quickly and easily re-tune for prominences on the solar limb. The stunning bright red views through a Coronado Ha telescope display astounding surface and limb detail especially when the Sun is in an active phase. The sun is now heading for Solar Maximum, when activity will be at it's best. Don't miss out!! This very high quality 60mm personal solar observatory features an 400mm focal length, f/6.6 focal ratio. Includes mounting rings, Cemax 25mm eyepiece, Sol Ranger solar finder and carry case. Weight is 8 pounds. Click the button below to add the Coronado Instruments SolarMax II Double Stack 60 w/BF5 Blocking Filter to your wish list.